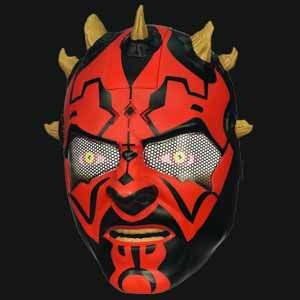 The Darth Maul Electronic Helmet is the latest release in Hasbro's line of Star Wars themed Electronic Helmets. The helmet is really a mask, as it only covers the front of the face, and is held in place with a couple of adjustable straps so that it fits all head sizes snugly. It is made from sturdy plastic, and is large enough that even adults can wear it and if you wear glasses there's still plenty of room to ensure that you don't get them damaged. 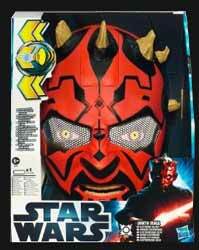 To get the electronic voice to play you have to push one of Darth Maul's horns - the result being one of a handful of phrases is played. I was quite impressed with how loud the voice was too. If you have a dark hooded cloak then this looks fantastic. It's another winner in Hasbro's Star Wars themed electronic helmet range.